I have been on vacation, and working up at the cottage this past week (August 1 - 10). It may look like a lot of progress has been accomplished, since the last time I posted (basically I posted the last 12 days of posts - 12 days ago...), however, I haven't gotten where I was hoping to be. During the previous weekend - long weekend as I go up on Fridays - I maybe was able to get one full day of real work in. While I am about a month - or let's say 4 weekends behind schedule - the project is moving along. Fortunately the cottage is now closed in so any work on the inside can continue in spite of the rain. The roof is on and shingled, including two vents have been roughed in - the chimney will be installed in September. The stair landings have been roughed in - but no stairs yet. 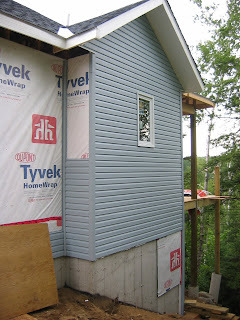 Siding has been installed on half of the east wall - with start strip installed on the rest of the east wall and on the front wall. I am taking a bit of breather from Cottage construction for the next two weeks - re-energizing my batteries so to speak - so we closed up the Cottage and locked it down on Sunday. Next work day is August 29th - although the electrician may be in to start his work.